Transverse section of Pinus sylvestris (Scots pine) in the first image shows the latewood portion of the growth ring. This surface shows latewood tracheids (transportation and structural cells) and also part of a ray (cells for storage of food substances). EDX spot analysis of the wood specimen using Oxford Instruments’ INCA Energy shows a small chlorine peak, which results from treatment of the wood with a preservative - shown in the graph. The specimen charges excessively unless carbon coated. Other types of coating cannot be used due to the very low levels of chlorine used in the preservative, with which the wood is treated. With thanks to Oxford Instruments. 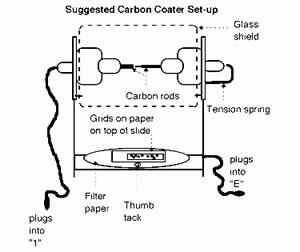 The use of carbon films in Electron Microscopy with their low background signal and relatively good electrical conductivity is well known. Thin films, nominally 5nm or 50 Angstroms, are used in TEM, while a range of somewhat thicker films, ranging from 50nm or 500 Angstroms, may be used in SEM for such applications as X-ray microanalysis. Commonly, a high vacuum evaporator with carbon rods is used to achieve these coatings, and still has preferential applications. The use of carbon fiber however, has allowed a flash evaporation technique to be developed which can be suitable for a number of general EM requirements. NOTE: Process uses a diffusion-pumped vacuum evaporator, for turbomolecular-pumped systems please modify the process as appropriate. For optimum results, vacuum levels in the range of 5x10-5mbar or better are recommended. Step 1. Copper grids should be pre-cleaned by sonicating for 10 seconds in acetone, followed by 10 seconds of sonication in ethyl alcohol. Allow grids to dry on filter paper in a dust-free environment before use. Step 2. Add 0.12g of formvar powder to 50ml of ethylene dichloride and mix well on a magnetic stirrer until dissolved. Pour the solution into a clean coplin jar. Step 3. Clean a glass slide with water and detergent. Rinse well to make sure that all of the detergent is removed and finally rinse in de-ionized water before drying with a paper towel. Blow off any lint on the slide with compressed air. Place the slide in a dry, dust-free environment such as on filter paper under an upturned beaker. If there are problems in getting the plastic film to be released from the slide (Step 5), using a slide that has not been as thoroughly cleaned might help. Step 4. Dip the cleaned slide into the formvar solution (step 1 in picture) and touch edge to filter paper to drain off the excess fluid (step 2 in picture). Dry upright in a dust-free environment (this requires 5-10 minutes). Step 5. Score the edges of the formvar film with an acetone-cleaned razor blade (step 3 in picture). Breathe on the slide to loosen the film, and slowly slide off onto a clean water surface by immersing the slide into the water at a -15° angle (step 4 in picture). Place grids, dull/rough surface down, onto good (uniform, grey color, un-wrinkled) areas of the film. Place a small piece of clean, white office paper onto the surface of the grids and film and allow the paper to soak up water. Pick up the paper, grids and film and place in a covered petri dish to dry. Step 6. Carbon coat film according to directions (see Section C) to desired thickness - a light-brown color indicates a thickness of 100Å. Step 7. Place the paper and coated grids onto a piece of filter paper that is soaked with ethylene dichloride in a covered petri dish. 30 minutes should be sufficient time to dissolve the Formvar film and not damage the carbon support. Remove the grids and paper and allow them to dry in a dust-free area. Step 2. Add 0.17g of formvar powder to 50ml of chloroform and mix well on a magnetic stirrer until dissolved. Pour the solution into a clean coplin jar. Step 3. Clean a glass slide with water and detergent. Rinse well to make sure that all of the detergent is removed and finally rinse in de-ionized water before drying with a paper towel. Blow off any lint on the slide with compressed air. Place the slide in a dry, dust-free environment such as on filter paper under an upturned beaker. If there are problems in getting the plastic film to be released from the slide (Step 6), using a slide that has not been as thoroughly cleaned might help. Step 4. Add about 50 drops of a 50% glycerol/water solution to the surface of the formvar solution. Place the tip of a probe sonicator onto the surface of the solution and sonicate until mixed. Sonication intensity should be great enough to ‘violently’ cause the solution to bubble. This often requires not much more than about five seconds. This should produce numerous holes that are 1-2µm in diameter and suitable for use with frozen-hydrated specimens. Sonicating for longer periods of time produces smaller holes in the film. Step 5. Immediately after sonicating, dip the cleaned slide into the formvar solution (step 1 in first diagram) and touch edge to filter paper to drain off the excess fluid (step 2 in first diagram). Dry upright in a dust-free environment for about 5-10 minutes. Step 6. Score the edges of the formvar film with an acetone-cleaned razor blade (step 3 in first diagram). Breathe on the slide to loosen the film, and slowly slide off onto a clean water surface by immersing the slide into the water at a -15° angle (step 4 in first diagram). Place grids, dull/rough surface down, onto good (uniform, grey colour, unwrinkled) areas of the film. Place a small piece of clean, white office paper onto the surface of the grids and film and allow the paper to soak up water. Pick up the paper, grids and film and place in a covered petri dish to dry. Step 7. Place the paper with the film and grids onto a methanol-soaked piece of filter paper in a covered petri dish for about 30 minutes. This should perforate any pseudo-holes that may be in the films (these occur when a small drop of glycerol was present but it was not enough to perforate the film). After allowing the paper and film to dry, the grids may be examined in a light microscope under phase contrast to determine the quality of the films. Step 8. Carbon coat film according to directions (see Section C) to desired thickness - a light-brown color indicates a thickness of 100Å. Step 9. Place the paper and coated grids onto a piece of filter paper that is soaked with ethylene dichloride in a covered petri dish. 30 minutes should be sufficient time to dissolve the formvar film and not damage the carbon support. Remove the grids and paper and allow them to dry in a dust-free area. Step 1. Turn shadow evaporator on: Turn both the main and mechanical pump switches on. Move the black-knobbed, manifold valve handle downwards to ‘backing’ position. Open the air inlet valve and CAREFULLY remove the implosion shield and bell jar. Set the bell jar upside down on the rest on the adjacent cabinet. Step 2. Set up carbon coating apparatus: Plug one lead to ground (‘E’) and the other to ‘1’ (see second diagram). Remove the cylindrical glass shield. Release the tension spring that holds the right carbon rod in place and remove the rod. File the edge of the left carbon rod flat with a piece of emery cloth. Replace the right rod with a fresh one or sharpen it by the procedure described below. Step 3. Carbon rod sharpening procedure: Place the carbon rod in the chuck of the sharpener. Pull the rod out until its edge is aligned with the edge of the aligning arm and then tighten the chuck. Turn on the sharpener and run the first sharpener tool against the rod until a conical point is formed. Then run the other sharpener tool against the rod until a narrow point is formed. Turn off the sharpener and clean off all carbon dust. Put the newly sharpened rod in the chuck of the carbon coater and tighten. Replace the tension spring and then the glass shield. Step 4. 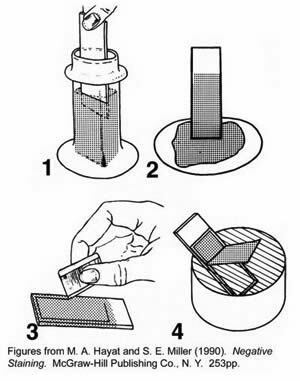 Set up grids: Place the grids and paper support on a piece of filter paper on top of the base of the carbon coating apparatus (see second diagram). Place a thumbtack alongside the slide. This provides a ‘shadow’ on the filter paper and helps you determine the relative thickness of the carbon coating. Step 5. Diffusion pump warm up: Replace the bell jar and the implosion shield. Close the air inlet, and move the manifold valve handle slowly upwards to the roughing position. Allow the vacuum to reach 0.04 Torr on the bell jar gauge and then move the handle downwards to backing. IMPORTANT: Turn on the water supply. The water supply-line valve is located on the wall behind the shadow evaporator. Turn on the diffusion pump switch and allow the pump to warm up for 15 minutes before continuing. Step 6. Obtaining a high vacuum: Move the manifold valve handle slowly upwards to the roughing position and allow the vacuum to reach 0.04 Torr on the bell jar gauge. While waiting for the vacuum to recover, fill the baffle with liquid nitrogen. When the bell jar vacuum has reached 0.04 Torr, move manifold valve handle down to the backing position. Depress the metal guard beneath the red mains valve knob and move the knob handle upwards to the open position Allow the vacuum to reach a minimum of 2x10-5 Torr or better. Step 7. Carbon coating: Turn the electrode selector to #1. Turn the electrode switch on. Slowly turn the electrode current control knob until there is a slight glow at the point where the two carbon rods meet. Slowly increase the current until the rods become white hot. The proper current setting should be just before the point where the carbon starts to sputter. Frequently monitor the thickness of the carbon by turning down the current, checking the darkening of the filter paper and then turning the current back up again. Step 8. Diffusion pump cool down: Turn down the electrode current control knob and turn off the electrode switch. Make sure the manifold valve is set to the backing position and close the mains valve. Open the air inlet, remove the implosion shield and bell jar and remove the grids. Then replace the bell jar and implosion shield, close the air inlet and move the manifold valve handle to the roughing position. Allow the vacuum to reach 0.04 Torr on the bell jar gauge, move the manifold valve handle to the backing position, turn off the diffusion pump, and allow the pump to cool for 20 minutes. Step 9. Turn shadow evaporator off: Close the manifold and turn off the mechanical pump and main power switches. Turn off the cooling water. Step 1. NOTE: Place the very edge of your carbon coated grids along the edge of a piece of doublesided tape on a glass slide. This will help to prevent your grids from flying around inside the shadow evaporator when the air release switch is opened. Step 2. Turn shadow evaporator on: Turn the main power switch on, turn on the mechanical pump and move the manifold valve handle (black knob) downwards to the backing position. Open the air inlet. CAREFULLY remove the implosion shield and bell jar. Step 3. Set up glow discharge unit: Plug the lead into the proper receptacle (BNC connector). Place the glass slide with your grids on the unit and replace the bell jar and implosion shield. Close the air inlet, turn the butterfly switch by the current gauges to glow discharge and move the manifold valve handle slowly upwards to the roughing position. Allow the vacuum to reach 0.2-0.15 Torr on the bell jar gauge. The manifold valve may be turned to the closed position if the vacuum rises above 0.10 Torr. Step 4. Glow discharging: Turn the electrode selector to position #1 and turn the electrode switch on. Slowly turn up the electrode current until there is a bright purple glow surrounding the glow discharge unit. Maintain this setting for approximately 10 seconds while monitoring vacuum. Turn off the electrode current control knob and the electrode switch. Move the manifold valve handle to the backing position. Turn the butterfly switch back to the evaporator setting. Step 5. Turn shadow evaporator off: Slowly open the air inlet to prevent your grids from being blown around the bell jar. Remove the grids, replace the shields and then close the air inlet. Move the manifold valve to the roughing position. Allow the vacuum to reach 0.04 Torr on the bell jar gauge before moving the manifold valve handle to the horizontal (closed) position. Turn off the mechanical pump and the main switch. Carbon Turbo Evaporators and Carbon Coater are available online from the EMS Catalog. For ordering or product information, click here.